The COMTF library and archive contains reference materials and documents about sudden oak death that can be used for research or training purposes. Below is an alphabetical list of what is included. Bibliography: A comprehensive list of publications addressing numerous aspects of Phytophthora ramorum research. Chronologies: General P. ramorum Chronology; Nursery Chronology; and the Acronym Glossary. COMTF Program Documents: Task Force documents available for download, including informational pamphlets, diagnostic guides, educational materials, brochures and best management practices. These are primarily available in .pdf format, and require Acrobat 5.0 or higher. Education and Training Resources: Interactive activities for youth as well as documents available for downloading such as: activities for educators, handouts, posters, and Power Point presentations including Virtual Training Guides and the PRED program. Historical Archive: A variety of older documents that we have removed from active pages but may still be of interest for historical purposes. Host of the Month Archive: Detailed information on P. ramorum host species, as detailed in past versions of the COMTF newsletter. Newsletter Archive: All of the previous monthly newsletters and year-end summary reports in PDF form. Past Events: An archive of past COMTF-sponsored and affiliated events. Press Releases: The full archive of all COMTF press releases to date. 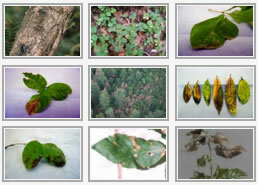 Research: Links and resources on many different aspects of Phytophthora research. SOD Blog Archive: Dispatches from the world of Sudden Oak Death, circa 2009. SOD Literature Summary: Kliejunas, John T. 2010. Sudden oak death and Phytophthora ramorum: a summary of the literature. 2010 edition. Gen. Tech. Rep. PSW-GTR-234. Albany, CA:. U.S. Department of Agriculture, Forest Service, Pacific Southwest Research Station. 181 pages.